Fury coming back from the kind of layoffs that ruin careers and performing so very well. We all know how he got up to 400 pounds, snorted nose clams and who knows what else — possibly, he survived a run-in with a trash compactor, based on what we saw Saturday — and yet he looked like the same fighter who stole the heavyweight crown from Wladimir Klitschko in 2015. Oh, it was awkward, and for stretches not much happened, owing to Fury’s elusiveness and Wilder’s clumsiness. Fury is like the innocuous dude who walks into the party during a dance-off, his nerd clothes hiding the breakdancing demon within. At 6’9″, herky-jerky as hell, his hands jittering like chihuahuas, he still slipped almost everything Wilder threw at him. And after establishing himself defensively and with his jab, he started piling on damaging 1-2s. 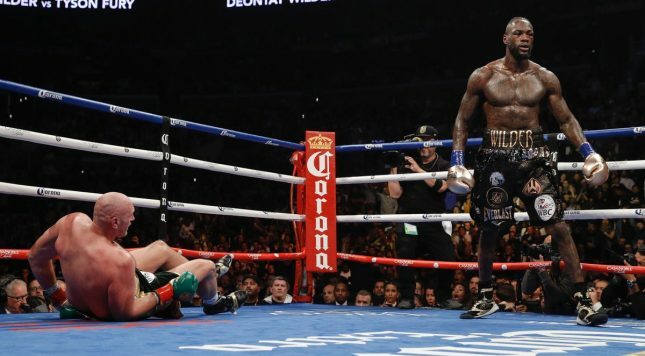 Only, as if you need a reminder, against Wilder “slipped almost everything” isn’t good enough. He just piles on the slop until something connects, and then his opponents go down. As long as he slings his arms and makes contact at all, a knockout might ensue. If it happened to you in a video game, where your opponent just grazes you and you die, you’d break your controller against the wall. Wilder, somehow, does that. The 9th round right hand knockdown hit a ducking Fury — his go-to move that worked so often — on the top of his head. The 12th round knockdown was better, a right/left combo that still didn’t land in a way most would consider all that technically correct, but it was enough. And not only did Fury get up, he actually might have hurt Wilder after that. Kudos to ref Jack Reiss for giving Fury a chance to finish the round. You’ll find fewer scribes in this sport who call for a quick hook faster than yours truly, but it was the right call. Both said they’d like to do it again. So would most of us, one expects, like to see it again. Fury deserves a chance to do it on his turf after coming to the United States for this one. Anthony Joshua figures in here somewhere, as do the possible, lamentable stay-busy bouts of interference. It certainly didn’t have a classically dramatic arc, did Wilder-Fury I, but it was amply delightful. The heavyweight division has been “back” for a while. This added another sizable confirmation.